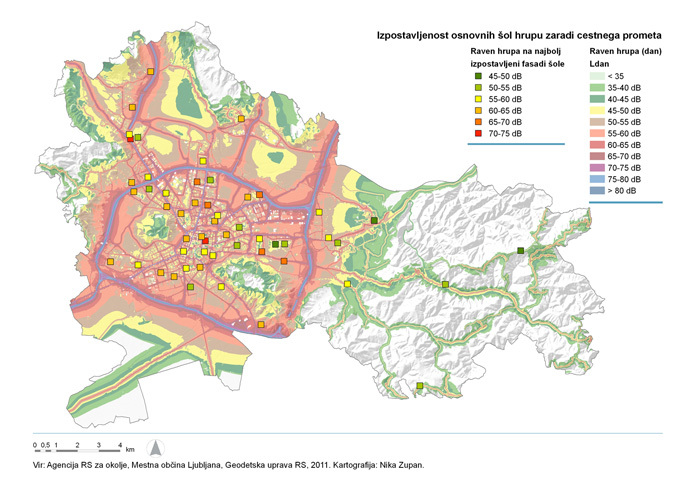 Children in primary schools and kindergartens in Ljubljana are potentially exposed to excessive levels of noise from road traffic. Among 110 kindergartens and 53 primary schools, 14 kindergartens and 3 schools are located in the area, where the limit value of environmental noise for playgrounds (55 dB (A)), defined as the recommendation of the World Health Organization is exceeded. In the school year 2010/2011 498 school pupils and 1429 children in kindergartens were exposed to elevated noise levels in Ljubljana. Therefore, it would be recommended to perform noise measurements inside these premises. Slovenian Environment Agency, Municipality of Ljubljana, 2011.